TimBookTu's goal is to become THE online resource and repository for African American writing and poetry. TimBookTu is a community where writers and readers alike can find various types of poetry, fiction, non-fiction, essays, and other written forms. TimBookTu has served as the vessel to present new and up-and-coming writers to a wider audience. Although its main focus is African-American or black culture, TimBookTu offers writing and poetry from other members of the African Diaspora regardless of the resident country. TimBookTu does not seek to exclude any group but feels that its main emphasis will be writing of an Afrocentric nature or those with an African heritage. TimBookTu was established in October 1996. Since that time it has featured the works of over 2500 writers and poets. It has been recognized by several sites such as Black Issues Book Review magazine, Black Reign newspaper, Black Writers Alliance, BET, EUR, and many other sites. Numerous other web sites have linked TimBookTu to their sites. TimBookTu is a free site and thus payment for works submitted is not possible at this time. All works should be original and if they have been previously published, permission must be granted to TimBookTu by the author or the owner of the rights to that work. TimBookTu is a copyrighted site. 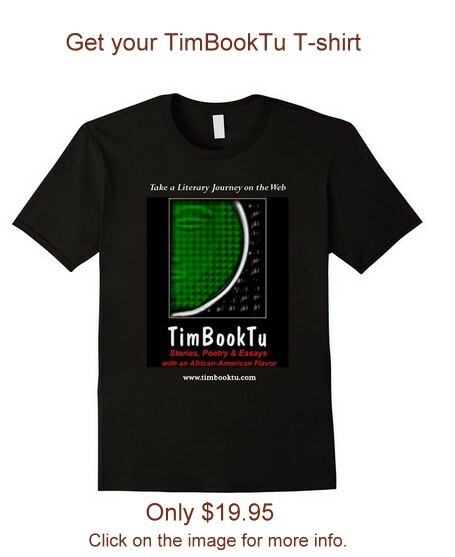 While all works submitted remain the property of the writer, the web pages are the property of TimBookTu. Support TimBookTu with a purchase.